But not fully understanding these two home heating system workhorses is a lost opportunity. Understanding the ins and outs of a furnace vs. boiler can help you make better decisions about which one is best for your home energy needs, which in turn can help you better budget your energy costs. 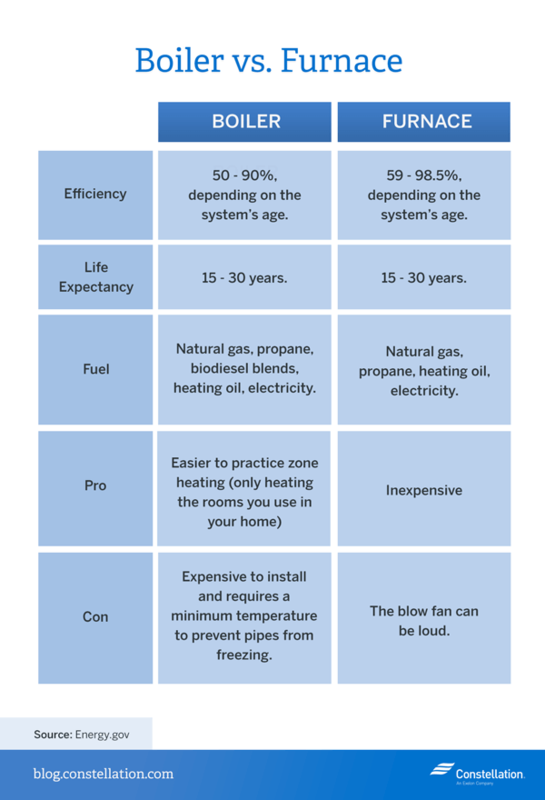 There is a difference between boiler vs. furnace energy efficiency, for instance. 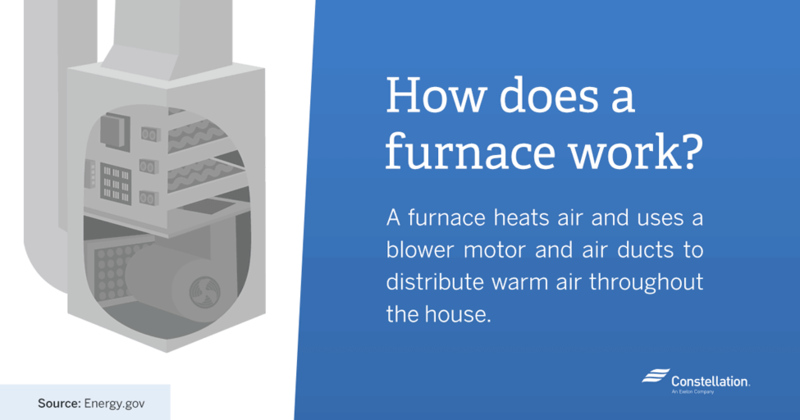 Let’s start with the basics of how a furnace vs. boiler works. The water is turned into steam or hot water. Steam heat moves through pipes into the rest of the house and is dispersed through radiators. Hot water versions move water through baseboard radiators or radiant floor systems, or they heat air via a coil. Boilers run on various energy sources, including natural gas, oil, electricity, and wood. The heat is distributed by a blower through your home’s duct system. The hot air is released into the room through registers or vents in the floors, walls or ceilings. Also known as hot air heating systems, furnaces can run on electricity, natural gas, propane, or oil. Furnaces are more common in newer homes because they generally cost less than boilers. There are, however, pros and cons to each. Boilers are typically more expensive than furnaces. Home improvement site KompareIt says boilers, which are more complex to install than furnaces, typically cost $2,500-$4,000 for a mid-range model, while high-efficiency boilers cost between $5,000-$10,000, including installation. Steam, gas and hot water boilers cost about the same, but steam boilers operate less efficiently so that’s something to keep in mind as you consider which boiler is best for your household energy needs. Removal of your old boiler can range from $500-$1,000, depending on the size and difficulty of the removal from your basement. More consistent heat: This could be a big consideration when pondering whether to get a furnace or boiler. Less operational noise: Boilers are generally quieter than furnaces because you don’t hear the sound of hot air blowing. Less maintenance: Boilers do not have filters that require cleaning, for instance. Better air quality: Since boilers don’t blow air, they don’t spread dust or allergens. They also don’t dry out the air as much as blown hot air would. 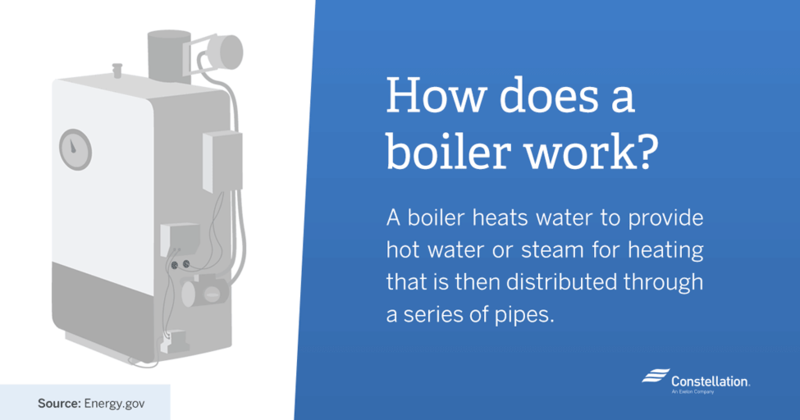 Slower to react: Boilers take longer to adjust to thermostat changes. That means it takes longer for you to feel a temperature change after turning the heat up or down. Harder to install: Boilers are more difficult to install than furnaces. Harder to convert: Switching from a boiler heating system to one run by a furnace is almost impossible. Adding the duct work to pump air through your home would be cost-prohibitive. Also, boilers don’t cool homes, so if central air conditioning is important to you, you likely want to stick with the furnace/duct system. Leaks pose a hazard: If your boiler leaks water, your home can sustain serious water damage. 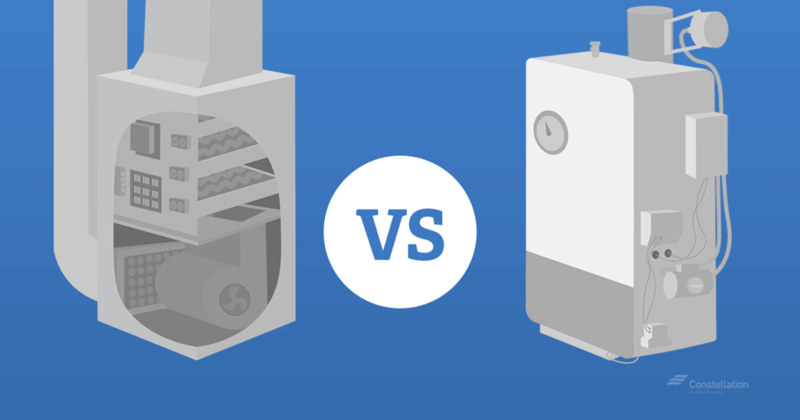 When considering whether to go with a furnace vs. boiler, cost can matter. KompareIt says the average furnace costs between $2,000-$3,500, including installation. High-efficiency models can run $5,000 and up, including installation. Removal of an old furnace can cost as much as $1,000, depending on size and difficulty. Less expensive: Since furnaces are more common than boilers, they are less expensive, sometimes even by half as much as the price of a boiler. Reduced leak hazard: Furnaces that leak usually only leak air, which is clearly less able to do damage to your home than a boiler filled with water. No freezing hazard: Since furnaces do not contain water, the system is not in jeopardy of freezing if the power goes out. In contrast, heating pipes can freeze and potentially burst if the temperatures go too low in a prolonged power outage. Easier to install: Furnace installation typically takes a few hours, as compared to days in some boiler installations. Less efficient: Heating with air is less efficient than heating with water. That means that your furnace will use fuel more quickly than a boiler, potentially increasing your energy costs. More noise: Furnaces blow air and that makes sound. You hear a furnace every time it turns on. Reduced heat consistency: Forced air heat is not as consistent as steam or hot water heat. As a result, some rooms may be cooler or hotter than others. Inferior air quality: Since furnaces blow hot air, they also blow dust and allergens. Additionally, the air will likely be drier in the winter than if you have heat that comes from hot water or steam. The first thing to note when thinking about your heating energy efficiency is the age of your furnace or boiler. Energy.gov says that older furnace or boiler systems generally were only energy efficient in the 56-70% range. Today’s systems can be as high as 98.5%. That means that practically all the fuel you buy goes directly toward heating your home. Having a more energy-efficient furnace or boiler can mean cutting your fuel bills and pollution output in half. Upgrading your furnace or boiler from 56% efficiency to the 90% range, Energy.gov says, could save 1.5 tons of carbon dioxide emissions annually if you heat with gas. That number goes up to 2.5 tons if you heat with oil. Some easy ways to improve energy efficiency include considering the various types of furnaces or boilers. Energy.gov recommends switching a gas furnace that has a pilot light, for instance, to one with electronic ignitions. Energy efficiency in boilers and furnaces is measured the same way — by annual fuel utilization efficiency (AFUE). A unit that has an AFUE of, say 70, converts 70% of its fuel to heat. The other 30% is lost. The federal government dictates that gas- and oil-powered furnaces can’t have an AFUE rating of lower than 78%. High-efficiency furnace models must have AFUE ratings of 85% or higher. 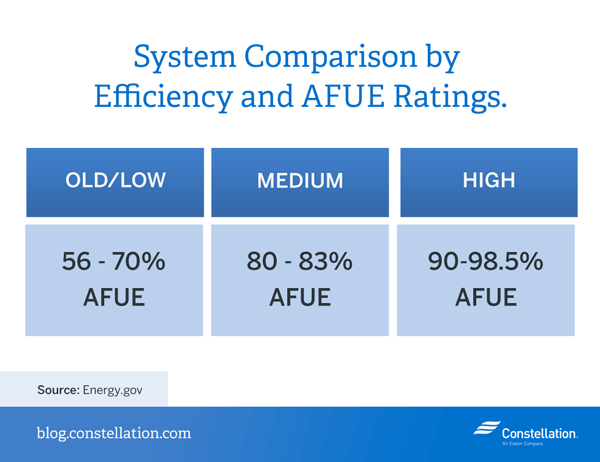 AFUE ratings for boilers depend on the type of boiler and its heating source. KompareIt says that steam boilers running on oil have a minimum AFUE of 82%. A steam boiler running on gas, meanwhile, would have a minimum of 80%. Hot water boilers have a minimum of 82% for gas models and 84% for models that run on oil. Energy.gov says boiler vs. furnace energy efficiency can also be compared by noting certain equipment features. In addition to looking at AFUE percentages, Energy.gov suggests taking note of whether or not the heating system has a pilot light. Having a continuous pilot light, for instance, is less energy efficient that either having no pilot light or having a system that condenses flue gases in a second heat exchanger that provides extra efficiency. The most energy efficient heating systems also have sealed combustion. It doesn’t matter whether you have a furnace or a boiler— if you don’t take care of it, it won’t operate at its optimum. And that means you could be losing money as you heat your home less efficiently. Here are some recommended maintenance tips from Energy.gov. Check your vent connection pipe and chimney. A chimney problem may be a reason to install new equipment that doesn’t need to use the existing chimney. Adjust boiler or furnace controls to make sure settings are best for water and/or air temperatures for efficiency and comfort. If you’re considering replacing or retrofitting your current system, Energy.gov recommends having a technician perform a combustion-efficiency test. Check combustion chamber for cracks. Remove dirt, soot or corrosion from furnace or boiler. Check fuel input and flame characteristics and adjust if needed. Seal connections between furnace and main ducts. Inspect pressure tank, which should be filled with air only. Drain some water from the boiler to remove sediment and improve heat exchange efficiency. Test low-water cutoff safety control and high-limit safety control. Drain float chamber to remove sediment, which will prevent clogging. Analyze boiler water and add chemicals as needed to control deposits and corrosion. Ultimately, the energy efficiency of your home can save — or cost — you money. Although you might not think too much about your furnace or boiler when everything seems to be working fine, it’s important to understand how they work so that you know you’re doing the best you can to keep your home running efficiently. Performing the recommended routine maintenance on your furnace or boiler can save you a lot of money (and headaches), so check out your system soon! Thank you for sharing this with us. It was really helpful and knowledgeable. I know some people who provide boiler heating system. Hi Olivia, thanks for stopping by the blog, we’re glad it helped! Hi Jane, boilers cost more money to install, but run more efficiently. If initial costs matter more to you, we suggest a furnace. If energy efficiency and potential cost savings matter more, a boiler may be a better option. Hi James, we’re glad you enjoyed our Boiler vs Furnace comparison! If a system is only 80% efficient, for example, where does the 20% energy “loss” go? Since energy cannot be detroyed, I would think that that it would be lost through heat/friction/etc, which, in turn, heats your home, with the exception of heat that is lost to the earth, which is more a function of your home’s surface area. Where am I missing something? The lost energy we speak about can escape from the chimney or through pipes in attics and garages. Thanks for the question! You make some good points. Thanks for the comparicons. Hi, Lisa! I am glad that this was helpful to you, and I appreciate your taking the time to comment. Be sure to check back on the blog soon for even more on making your home energy efficient.